This site is about improving performance using recognition, especially positive recognition. While OhioTennisZone.com is focused on high school tennis, the approach used for tennis is the same as for what Gerber Analytics, LLC does for education (www.GerberAnalytics.com/ogt/ogt.php). If performance is properly measured and compared with the performance of others, "all boats rise" as individuals and teams strive to do better. Why do this for tennis? Tennis is very under-served by the media in general, especially in Ohio, where high school football and basketball garner most of the attention. While I am not a great player, both of our children played high school tennis. While tennis results data is the backbone of the site, team and action photos now play a major role. OhioTennis-Zone.com (OTZ) has by far the most high school tennis photos of any media site. It is also not just about quantity. OTZ has received media credentials for the last two years from the Western & Southern Open and from the NCAA Division I and Division III tennis tournaments. Photos are commonly re-tweeted from event organizers, and tennis professionals have requested and used OTZ photos on their own online pages. While this web site is not even close to being lucrative from a financial standpoint, those people and teams who are paying members are greatly appreciated. Like most small businesses I do not get a salary (not even minimum wage), but OTZ does largely cover its expenses. People commonly ask if this web site will be offered to other states and to other sports. At this point, the answer is "no". It is not currently scalable. It is a seven day a week effort that goes from early in the morning until late at night during the boys and girls high school tennis seasons. OTZ attends over 50 high school tennis matches and tournaments a year, taking photos, and talking with kids, parents, and fans. OTZ considers itself the advocate of tennis parents, players, fans, and coaches, and I am always going to be pushing the envelope to make this a better sport. If money is not the driving reason, why offer this web site? It is a great way to meet nice people and benefit others. It is also great to be recognized by others. 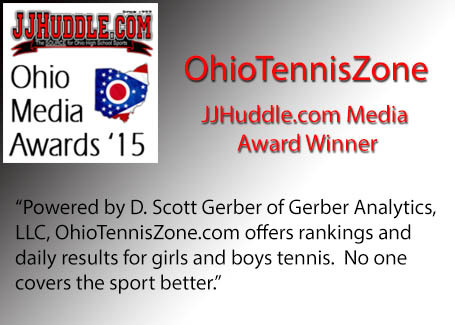 OhioTennisZone.com (OTZ) was very pleased to be recognized as one of the JJHuddle Ohio High School Media Award winners for 2015. Getting this award from JJHuddle.com means a great deal. They are the most followed and comprehensive high school web site in Ohio, covering all sports. Click to read the JJHuddle article. 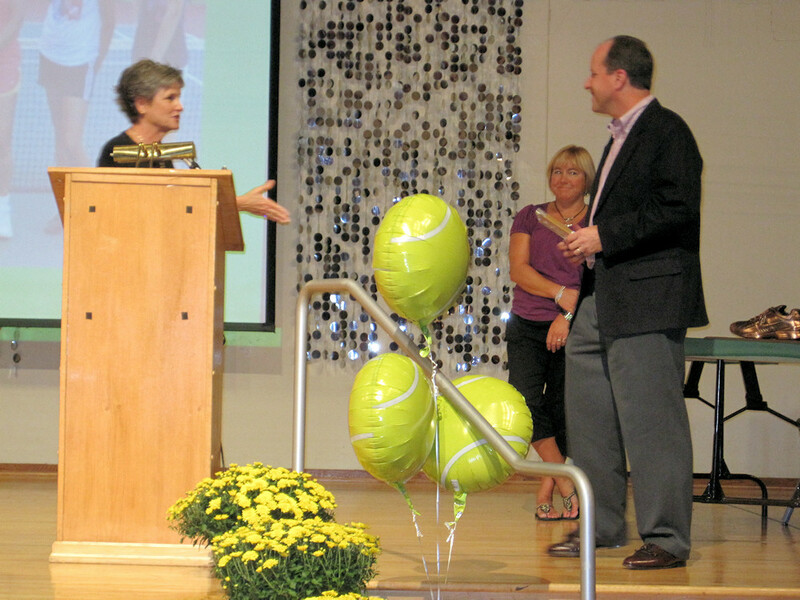 OhioTennisZone also received the Greater Columbus Tennis Association (GCTA) Media Award in 2011. I was asked and I agreed to join their board in 2012. Gerber Analytics, LLC also created the GCTA.net web site with the help of our daughter, Lauren. Why do I do this? I am a phenomenally curious person and I love reading books that deal with the social sciences (i.e. Malcolm Gladwell's Tipping Point, Blink, Outliers and Dan Ariely's Predictably Irrational). Education and tennis are my social experiments, and since I track online activity you are part of it (thanks for playing along). Since I was fortunate to retire rather early (after working at CompuServe / AOL and Bank One in a variety of areas), this is how I can keep learning and hopefully contributing. I am an alumnus of Miami Trace High School, which is a rural school located near Washington C.H. (There was no tennis team.) I graduated from Ohio State with a degree in Finance and Accounting. I also have an MBA from OSU. Almost all of my website skills are self-learned -- some poorly. Am I really good at tennis? No. I actually prefer playing platform tennis, which is an outdoor winter sport. Cold temperatures and gray, sun-free, Ohio skies make me very happy. I am a Columbus resident, and when I am not crunching numbers and working on this web site, I am tracking our investments, working on maintenance projects on the family farms (outside of Findlay and Washington C.H. ), playing platform tennis, or dodging household tasks. Contact me via a Feedback if you have any questions.